After a long production hiatus, the Ford Ranger finally makes its comeback to Kentwood Ford. The 2019 model incorporates all the hallmarks you’d come to expect from modern Ford vehicles, including an EcoBoost engine, 10-speed automatic transmission, and the latest in SYNC technology. So, how does it stack up to other compact trucks on the market after all this time? We’re about to find out. 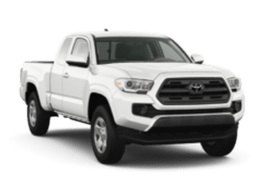 Take a look at how the Ford Ranger compares against the Toyota Tacoma, here at your north Edmonton Ford dealer! It shouldn’t be a secret that the Ranger takes the crown in this comparison. Back and better than ever before, the 2019 Ford Ranger excels at everything you can imagine with a compact pickup, all while delivering greater value at a lower MSRP. The Ranger’s 2.3L EcoBoost engine does more with less, producing excellent horsepower and even better torque compared to the Tacoma. Since we’re only comparing between base-models for each truck, it’s definitely worth noting that the Ranger already comes with 4×4 wheel drive, as well as Ford’s intuitive 10-speed automatic transmission, right from the get-go. Additionally, the Ford Ranger also gives you better payload and towing capacities across the board, letting you do more for all your outdoor adventures and jobs. On top of the Ford Ranger’s ability to produce more horsepower, torque, and incorporate impressive driving technologies, it still manages to stay more fuel efficient than the Tacoma. Thanks to Ford’s revolutionary EcoBoost technology, the Ranger only consumes up to 11.8 L/100km in the city and 9.8 L/100km on the highway. Test drive the all-new Ranger, today!